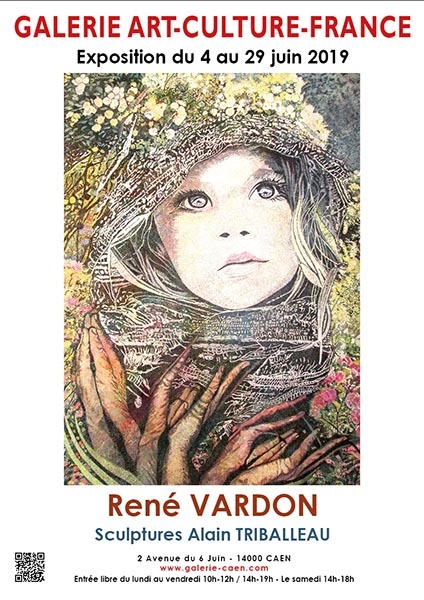 René Vardon has two passions: painting, of course, but also a devotion to the Arts and artists. This led him to found the Association "Terroir de Caux" and the famous "Salon des Trois Vallées", thereby reuniting creators from the towns along the small coastal rivers, the Dun and the Saâne, and its tributary, the Vienne. In the celebration of timber-framed and thatched cottages that is the Pays de Caux region, René Vardon built himself a dovecote-workshop from which he would create and teach. Yet he takes heed to exhibit his work both in France and abroad, charming those who have visited galleries and salons for the past thirty years. Several juries have awarded him the most enviable prizes and distinctions throughout his impressive career. First, Rene Vardon's landscapes convey a rare movement, which is simply fascinating, while his accuracy of a high-quality dominates in seascapes wherein he dares and succeeds to create beautiful effects of shadow and light. Attentive to the world of the strange in his portraits and his Venetian visions, René Vardon animates perfectly certain more intimate creations by brilliantly developing an amazing pointillism. This technique further enhances the shimmering light effects he seeks, as well as the colours, which are used with elegant moderation to suit impeccably-composed paintings that are steeped in charm and prove incomparably attractive.